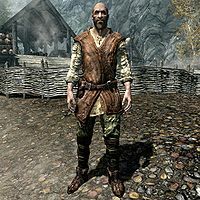 Klimmek is a Nord citizen and a resident of Ivarstead. He's sharing his house with Bassianus Axius, who was looking for a job and a place to live, both currently working together as fishermen. However, they don't get along very well. Klimmek thinks Bassianus is spending too much time coming up with new ideas to make profit instead of actually fishing. 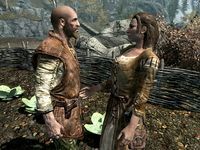 On top of that, they both apparently fancy the same girl, Fastred, with whom Bassianus is planning to leave to Riften—although it doesn't seem Bassianus is aware of his housemate's feelings towards his girlfriend. During The Book of Love, you can choose to help Klimmek convince Fastred to stay in Ivarstead. Klimmek also supplies the Greybeards with food from time to time. Due to his age and the difficulty getting to High Hrothgar, he's hesitant to make the next delivery. He'll mention this when he greets you with: "I wish I could make my deliveries more often, but the road's getting dangerous." and "7,000 Steps indeed... next time they need to build it closer to the ground..." Similarly, ending the conversation leads to:"Welp [sic], time to gather more supplies I guess." You can start the quest Climb the Steps by offering to make the delivery in his place. He wears a set of farm clothes and a pair of boots, and carries around a belted tunic for sleepwear. He is equipped with a leveled dagger which can be up to elven quality, and carries a key to his house, as well as a selection of common loot and gold. 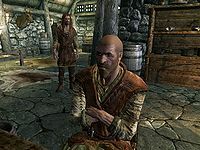 Initially, he'll be found on the bridge leading to High Hrothgar, waiting for you to trigger his conversation with Gwilin, which will be achieved by approaching them. When the conversation ends, he'll get to his usual daily routine. He wakes up early in the morning at 4am to have breakfast with Bassianus for an hour. On weekdays he goes fishing at 5am at the Treva River, south of the lumber mill across Narfi's house. At 1pm, he heads over to the Vilemyr Inn to have lunch for an hour, then afterwards gets back to fishing. After four hours, he'll head back to the inn for a one hour dinner. He returns to fishing for another four hours, finally going back to bed at 12am to have a short night's sleep. On weekends however, he stays home instead of going fishing. Like most citizens of Ivarstead, you can ask him what he knows about High Hrothgar, to which he admits: "I've been to the monastery many times, but I've never even laid eyes on one of the Greybeards. Not that I'd care to. Being masters of the Thu'um, they could kill you by uttering a single word. Well, not that they would. They seem peaceful, but I wouldn't want to provoke them." "I'm becoming sick to death of your ideas." Klimmek: "We're behind again. I need you to catch another two bushels by week's end if I'm to make another delivery." Bassianus: "Blood from a stone, Klimmek. I've been out there every morning. They just aren't biting." Klimmek: "Come on, everyone in town knows that you spend more time with Fastred than fishing in the river." Bassianus: "That's none of your business and I appreciate if you wouldn't mention it again." Bassianus: "If you have a moment, I've come up with a few ideas I wanted to share." Klimmek: "I'm becoming sick to death of your ideas. Not one of them has paid off since you moved in." Bassianus: "Look, I'm merely suggesting a few things that could expand our business." Klimmek: ""Our" business? As I remember things, it was you that showed up at my doorstep looking for a job and a place to live. Try and remember that." Klimmek: "I thought you played wonderfully last night." Lynly: "Thank you Klimmek. That's too kind." Klimmek: "Perhaps when you're finished here this evening, we could..."
Lynly: "You're sweet. I'm just not ready for that sort of thing right now. I'm sorry." Wilhelm: "You heading up to High Hrothgar soon, Klimmek?" Klimmek: "I wish I didn't have to. It's quite a difficult climb." Wilhelm: "Take your time then. It isn't as though the Greybeards are going to complain." Klimmek: "I know, but I don't want to let them down. I guess I better start thinking about it soon." Klimmek has been holding off on his delivery because he feels his body can't cope anymore. Nevertheless, this task is important to him, putting a weight on his shoulders as he believes he'll have to make the climb sooner or later. This is apparent when you approach him, when he asks: "Passing through on your way to High Hrothgar? About to make a delivery up there myself." You'll be able to hear him out about it when you ask him what type of deliveries he makes to High Hrothgar: "Mostly food supplies like dried fish and salted meats; you know, things that keep fresh for a long time. The Greybeards tend not to get out much, if you catch my meaning." When you ask him what they'll give him in return, he admits: "Well, it's kind of an understanding between us. I mean, it just wouldn't feel right to charge them for a bit of preserved food. Trouble is, my legs aren't what they used to be and climbing the 7,000 Steps takes its toll." You'll be able to propose doing it for him at this point, which will relieve him of his burdens: "Really? That would be kind of you. Here, take this bag of supplies. At the top of the steps you'll see the offering chest. Just leave the bag inside and you're done." If you simply tell him you can't help him, he'll continue by pondering about what to do: "Maybe I'll hold off and go another day. Get some rest first." 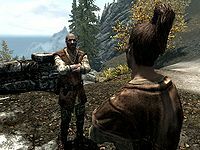 When he's given you the supplies to deliver, you can ask him what to expect on the way up to High Hrothgar: "Well, there's the occasional wolf pack or stray, but that's all I've ever had to deal with. Shouldn't be a problem for the likes of you. Other than that, watch your footing. In these wintry conditions, the stairs can be treacherous." In truth, the path up is far more dangerous than the occasional wolf. Depending on your level, you may encounter ice wolves, frostbite spiders, bears (all variations), ice wraiths, and even frost trolls of which one is guaranteed. It's only justified when he takes his leave with: "Be careful up there." You can return to Klimmek after having put the supplies in the chest outside High Hrothar, and he'll joyfully greet you: "Ah, good to see you again! How did that delivery go?" When you tell him you've successfully delivered them, he'll remark: "Quite a climb, wasn't it? Anyway, much appreciated. Here, take this for your troubles. ", which is when he gives you a leveled amount of gold. After this, the first thing he'll say when greeting you is thanking you again: "Thanks again for delivering those supplies to the Greybeards." He will similarly end the conversation with: "Thanks again for the legwork." Your first task during The Book of Love is to help Fastred with her love problems. She'll tell you that she's looking to move out of Ivarstead with Bassianus Axius. However, by doing a little digging you'll find out Fastred's intentions are more complicated than that, as her emotions seem to be running high due to her young age. You'll already be able to tell her she seems confused when she's asking you to help her out, to which she admits her uncertainty: "I don't want to choose! They're both so amazing." Wilhelm: "Have you spoken to Fastred yet?" Bassianus: "No. I'll tell you, Wilhelm, if I could sweep her away from here tomorrow I'd do it, but Klimmek still has so much to learn." Wilhelm: "Klimmek is doing just fine. You should follow your heart." Bassianus: "Perhaps one day, but not today." If you speak to Fastred's father, Jofthor, he'll tell you her feelings are but a phase and aren't to be taken seriously, as he admits: "Until a few months ago, the girl was head over heels for Klimmek. Wouldn't stop talking about him. Now if I thought she was really in love with Bassianus, that would be one thing. But she's a child. It will pass." Further questioning shows Jofthor seems aware of Klimmek's feelings for his daughter, and seems to prefer Klimmek over Bassianus, presumably because Klimmek has no plans to leave Ivarstead: "And like always, the boy lacks any kind of spine. He'll need some convincing. A little push and this would all be simpler." Klimmek: "Fastred, I have something to say to you." Fastred: "Klimmek? What is it?" Klimmek: "I don't want you to leave Ivarstead." Klimmek: "Because... I would miss you." Fastred: "But I thought you only cared about your fishing!" Klimmek: "What good are fish if you have to eat them alone?" Although he claims to make regular deliveries to High Hrothgar, neither Klimmek nor anyone else will ever resume making any actual deliveries, and his quest cannot be repeated. According to his relationship data, he's both friends with Bassianus Axius and Fastred. This is not changed by completing The Book of Love. Completing either Climb the Steps or the first part of The Book of Love in his favor will raise your relationship with him. This page was last modified on 1 March 2018, at 18:12.